I love cell phone trees. I have a portion of my Flickr site devoted to them. I gave out Christmas calendars that allowed me to share my favorite snaps of them with geospatial data. So I certainly noticed the cover of The Infrastructural City when I saw it in the window of my local art and architecture bookstore. From the text I learned that these sublime creations were also known as "Frankenpines" and could be seen as a symbol of how the city can be mapped as both artificial forest and web of potential communication nodes. Other essays acknowledged a confluence of interests around beloved local institutions like The Center for Land Use Interpretation. As a native Angeleno who married into a family of designers and landscape architects, I would probably have picked up the book even without the jaunty cellular specimen on the cover. Since the collection was edited by Kazys Varnelis, who also edited the excellent recent title Networked Publics in which the collaboratively written essays avoid the exhausted utopian paeans or dystopian diatribes that fill far too much of the computational media bookshelf, I found myself recommending it to others. Now the Los Angeles Times is suggesting that even more people should be reading Varnelis's book, since the Obama stimulus plan is calling for infrastructure-building at a time when critical reflections on the nature of infrastructure are few and far between. 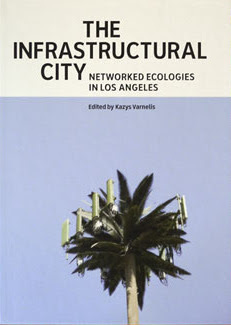 Check out "What's the future of 'The Infrastructural City' of L.A." for the review.